If you own or run a small local business or a franchise such as a restaurant or shop, you probably care about your reputation. Word-of-mouth marketing it nothing new: People are social, and tend to share their experiences. But with new tools such as FourSquare, Instagram, and Facebook, people don't just share: They broadcast, and you should be listening. VenueSeen (plans start at $20/month; 14-day free trial) lets you listen to what people say about your business and look at the photos they share. VenueSeen lets you view and share photos of your business taken by customers. When someone checks in on FourSquare, shares an Instagram photo, or posts a Facebook status update, the service often attaches their location to the status update or photo. When you register a new VenueSeen account, the service asks you to add a venue. It then shows you a dashboard with photos and messages about that venue, pulled in from Foursquare, Instagram, Foodspotting, and Facebook. 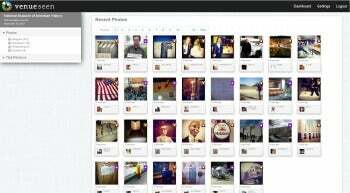 It also lets you filter photos by service, so you can look only at Facebook posts or Instagram photos, for example. When you click an individual photo in VenueSeen, it opens in a lightbox showing a larger version of the photo, the comment that was posted with it, and comments other users made about the image. You can also see who posted the photo, and if you click that user's thumbnail, you get to the person's profile page on Instagram or whatever service they used. 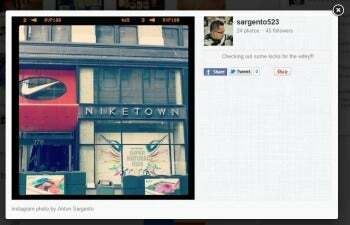 The lightbox also lets you tweet that photo, share it on Facebook, or pin it on Pinterest. This is brilliant, because it means you can take genuine moments your clients captured, and then broadcast them to show what your business is like. 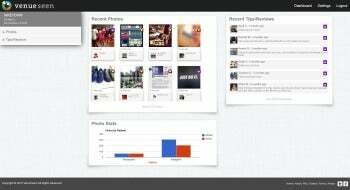 VenueSeen's dashboard aggregates photos and tips from social networks, presenting them in an easy-to-follow format. To see a user's Instagram profile, you don't need to have an Instagram profile yourself. Not so with Foursquare: If you wish to see someone's Foursquare profile page, you must be logged onto Foursquare with your own account: A drawback, but not something VenueSeen can do anything about. VenueSeen can use information from these networks, but it can't change the way they work. VenueSeen also lets you focus only on photos or reviews, and filter photos by platform. Despite this shortcoming, VenueSeen is an invaluable service for local brick-and-mortar businesses. Monitoring your online presence isn't just for big corporations anymore, and VenueSeen's clear and simple interface makes this task manageable, and even fun. VenueSeen lets businesses monitor their online presence and reputation in photo sharing and social networks.